As an outdoor photographer, I am constantly making mental notes in my head about locations. Anytime I happen upon a spot that I think may work for a photo, I file it away in my head as a possibility. Many of these spots I make a point to come back to during different times of the day and/or year to see them under different conditions. Morning, evening, summer, winter, fall, etc.. This shot had been filed away on the mental list for 3 years now. I had ridden through this meadow a fews time before, and had always thought it would be a great spot to photograph. I took this photo with my phone in 2008, as a reference for a spot I wanted to come back to. This was in November, and although the light was flat, I think the meadow itself, the perfect single track, and the snowy peaks provide a great balance. I knew for sure I wanted to come back and capture it with snow on the mountains, clear blue skies, and golden grass in the field. However due to the high elevation there is only a very small window in the fall when that happens. 2 days after I took this shot this meadow was covered in snow, and was done for the year. I was finally able to get this shot in Nov 2010. I had told Eric Porter about this location, and jokingly described the shot we could get here as "a cover shot". He had never ridden this trail, but was down to come shoot it. I had been watching the weather closely for just the right conditions, and the day finally came. We met up super early, not wanting to miss the morning light, and pedaled our bikes up the trail in the gray haze that is dawn. It was freezing cold, a storm had moved through the day before and gave way to crystal clear skies behind it. In Utah in late November this means cold.. We got to the spot with about 45 minutes to spare, and were riding up and down the meadow just to keep warm. The trail was frozen solid. As soon as the sun came over the hill, we snapped a handful of photos, and were on our way back to the truck. Mission accomplished. When Dave Reddick, Photo Editor for Bike Magazine called me, he didn't give me the whole story right away. He said "I just wanted to let you know that we are 99% sure we are going to use your photo in the June Issue" I was super pumped just with that, I have had my photographs appear in Bike Magazine before in various advertisements, but never for actual editorial purposes. I told him thanks for considering my images, and that I had been trying to get a shot in Bike Mag for a while. Then he came back with "Well it is technically not going to be IN the magazine.... because we are going to be using it for the cover." I couldn't believe it, from never officially having a shot run to one being used as a cover was HUGE for me. I thanked him again and hung up the phone. The point of all this is that these photographs don't just happen. Most people think of outdoor photographers as people who just "cruise" around and take photos of "whatever happens". It is true that on a rare occasion it may be a "right place, right time" shot but those are few and very far between. All the photographers I know who are shooting at the pro level work hard for their shots. Getting the shot is all about early mornings, late nights, freezing cold, blistering heat, rain, snow, ice, fog, dust, bad light, missed light, and 40 + pounds of gear to haul everywhere you go... and after all that you get some marketing guy asking you to give them a shot for "photo credit" because "they are a small company and can't afford it"... 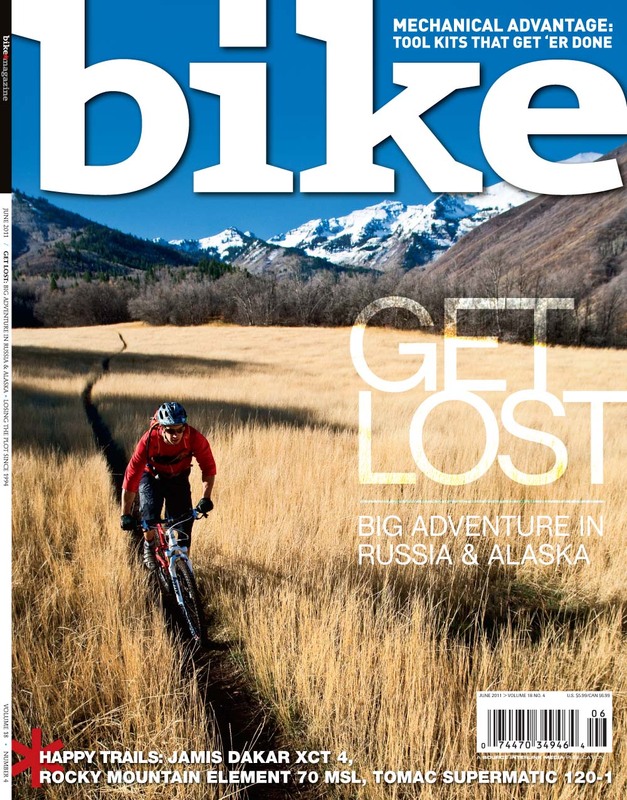 But I'm not gonna lie, it is a lot of fun, and seeing my photo on the cover of Bike Magazine for the first time is one of the small rewarding moments that make it all worthwhile. Thanks Bike mag for picking my shot!